Being a submissive wife is something that I personally believe is highly disregarded in today's time and perhaps the reasoning being due to misunderstanding the heart of God on the matter. Colossians 3:18 - wives, submit to your husbands, as it is fit in the Lord. Avoiding every disagreement between you and your husband because he said so. Being treated as if you are under your husband's feet. The doormat that he wipes his dirty shoes on. Submission is allowing your husband to take leadership and fulfill his duty of being head of the household. A healthy marriage consists of a team; teams make decisions together but there's always a leader who has the ultimate say. This is how God set it up and he gave the husband the ultimate say. But husband's don't get off easy; In fact, a husband should read this post just as much as the wife simply because submission comes a lot easier when the husband takes on his role of loving his wife as Christ loved the church. When the husband is committed to his wife and loves her like Christ loves the church, the 2 naturally want to serve each other. Wives, understand the importance of your husband's role. Do not take it lightly. God gave the husband/father the position of head of the household so understand that he will one day have to answer for the decision he made for his family. Be supportive of your husband. And submit to him, because ultimately you are submitting to God. I agree! Submission needs to be redefined as God's word says it is, not this world's rebellious, disrespectful ways! I have been married for years and honestly - this is an area I am certainly challenged by! 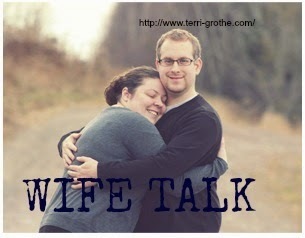 But you gave some great insight into this and particularly always praying for our spouses! Love this! Short and sweet! I am always happy to be reminded of this. I feel like our culture (even sadly the Christian culture) really pushes for the woman to exert her authority over her husband but I know that doing so only draws me away from the Lord and my husband because it is not God's design. I love how you clarify this ideal and share your personal opinion. You make some really valid points! Great post. I was checking constantly this blog annd I'm impressed!